Audens Avidius is a corrupt Imperial Watch captain. 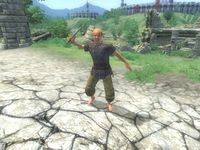 Recently, he has been fining citizens and shopkeepers in the Imperial City for various "thefts". You get to learn first-hand about his crimes during the quest Imperial Corruption. Other people are also apparently aware of problems: the candidate list during Taking Care of Lex states that Audens has "questionable morals" and is not a recommended candidate for captain of the Anvil Guard. Before the related quest, Audens' daily routine is that of a typical guard. He wakes up at 6am every morning and eats breakfast until 8am in his room, the Northeast Watch Captain's Quarters. He then heads off to do his morning rounds, walking around the Market District starting with the eastern gate area around 8am, the gate to the city isle around 9am, the west gate around 10am, and finally the gate to Green Emperor Way around 11am. He then takes lunch at the Feed Bag from midday until 2pm, before returning to do rounds of the Arena District in the afternoon. He starts with the north gate at 2pm, followed by behind the Arena at 3pm and finally the south gate at 4pm. Due to a bug, he does not cover the west gate as he should at 5pm, but rather heads back to the ground floor of Northeast Watch Tower to wander for an hour. At 6pm he eats there for two hours, and then wanders around until he heads upstairs and finds his bed at 10pm. 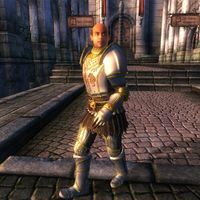 He was also intended to play a part in the unfinished Imperial Express quest; if Mariana Ancharia is still alive, he will head to the Black Horse Courier at midday on the 8th of every month, stay there for a brief moment, then return to his duties. Before the Imperial Corruption quest, Audens will only tell you about the Imperial City: "When the city is quiet, everybody is happy. Right? If you like noise, maybe you're in the wrong place." Before the related quest, Audens walks around in a full set of Imperial Watch armor, specifically the boots, cuirass, gauntlets and greaves. He wields a silver warhammer, and carries a blue & green outfit with pigskin shoes, both of which he slip into when he goes to bed. Additionally, he carries a spare pair of light brown linens. He has both the Imperial Watch Key and the NE Watch Tower Key. He also carries a small amount of gold. His quarters are on the top floor of the Northeast Watch Tower. Nothing of note or value can be found here, although the dinner table is set with cheap food, such as carrots, apples, cheese and bread. On the side is a bottle of cheap wine and another bottle can be found on top of a food cupboard at the foot of the bed. Audens life is turned upside down by the Imperial Corruption quest. Most of it goes on behind his back, not affecting him at all. Before Luronk gro-Glurzog and Ruslan agree to testify against him, if you ask him about 'Corrupt Imperial Watchman' he will respond with, "You must be stupid to accuse me of corruption to my face. In fact, I'm pretty sure you just attacked me. I think I need to arrest you for assaulting a member of the Imperial Watch." He will then give you a bounty of 1000 gold and receive a disposition hit of 25 points. Once both Luronk and Ruslan have agreed to testify against him, he starts to see some changes. He leaves the Imperial Legion faction, the Imperial Watch faction, and the Eight Cities Couriers Customers faction. His class is changed to warrior, and his level is changed to zero. Once Itius Hayn arrests Audens, his two keys are removed along with all of his armor and his warhammer. Itius and Audens share a unique conversation at this point: Itius greets Audens with, "Audens Avidius, you are under arrest for extortion and petty theft. Surrender peacefully and keep what little dignity you have left." Audens responds, "I'm surprised Itius. I didn't think even you would stoop to arresting a fellow Captain." To which Itius replies, "Only those who break the law." Audens last word is, "I'll take my chances in prison rather than fight you. Someday I'll get out and the weasel that turned me in will pay!" If you try to talk to Audens on his way to jail, he will say to you, "I've just been arrested for corruption, so I'm not in the mood to talk." Carmalo Truiand will replace him as the watch captain based in the Northeast Watch Tower. When he is put in jail, the rest of Audens' items are removed, and he is given pants and a shirt to wear. He is then removed from the IC Citizens faction and added to the Prisoners faction. The now defunct captain will be placed in the cell opposite Claudius Arcadia and will wander around 24 hours a day, without ever eating or sleeping. If you manage to talk to him while he is in jail, he will say, "Someday I'll get out of here and take my revenge on everyone that put me in prison." Audens will spend 10 days in jail minimum, however he will not escape from jail until you are at least level 5. When Audens escapes from jail, added to his inventory are an iron dagger and the Ramblings of Audens Avidius, his aggression changes to 25, his disposition towards you is set to -100, his responsibility goes down to 5, and he is placed at the gate to the Prison District from the outside. He will then track you down in order to gain his revenge, running the entire way. When he finds you, he will say, "First I'll kill you. Then I'll get Ruslan and Luronk. You'll all pay for what you did to me." You will be forced to kill him in self defense, which shouldn't prove too difficult as he will have no armor and be armed only with the iron dagger. Since he is an escaped prisoner the local Imperial Guard will attack him on sight, making no attempt to arrest him again, so if you don't want to fight Audens you can let the Imperial Guard take care of him. The note found on his body suggests that he took the same route out of the prison as you did during your own escape, despite being put in a different cell. It is possible to charm Audens enough to be able to yield to him after he breaks free from prison, this may lead to some unexpected topics depending on where you yield to him, such as him giving directions as a normal city guard. He also seems to have forgotten that Hieronymus Lex was one of his colleagues, responding with the following when asked about him: "Yeah. I've heard of him. Isn't he a soldier or guardsman in the Imperial City?" Note however that he will be stuck in place for the rest of the game, and will still try to arrest you when you have a bounty on your head or sometimes he can spawn outside any prison of any city you travel to, and give directions as any other random city guard. If you attack him while he is in his cell, but don't kill him with one hit, he will still act like a guard and try to arrest you, giving you the normal three choices, go to jail, resist arrest and pay gold. Audens is the present participle of the Latin verb audere (to dare, to be daring, to seize an opportunity) while Avidius is the adverbial form of the Latin adjective avidus (greedy). Thus the name Audens Avidius translates as "Greedily Daring" or possibly "Greedily Opportunistic". Audens was supposed to patrol near the western gate in the Arena District at 5pm. He will, however, return to the Northeast Watch Tower instead. After being imprisoned, Audens can still arrest you if you have a bounty. It appears that the relevant scripts do not get removed from him. Esta página foi modificada pela última vez à(s) 17h05min de 14 de setembro de 2015.